Libyan security forces have used tear gas to disperse hundreds of protesters after Friday prayers in Col Gaddafi's stronghold of Tripoli. Reports from Ras Lanuf described the sound of multiple explosions and heavy artillery on the outskirts of the port. Opposition fighters had reportedly advanced on the city. Pro-Gaddafi forces withdrew to Ras Lanuf two days ago after a battle. Rebels later said they had seized the airport at Ras Lanuf, while state television reported that the town of Zawiya had been retaken by pro-Gaddafi forces. There was no independent confirmation of either claim. The Libyan revolt, which broke out in mid-February to end Col Gaddafi's 41-year rule, had appeared to have reached deadlock. The BBC's Wyre Davies in Tajoura says the protesters were calling for the fall of the Gaddafi government when suddenly police opened fire with dozens of tear gas canisters and baton rounds. There were violent scenes here, just on the outskirts of Tripoli. This is significant because, of course, Col Gaddafi insists that everybody, especially in the country near Tripoli, loves him and that there are no protests. What we saw today after Friday prayers was a vociferous protest by anti-Gaddafi demonstrators. Then, all of a sudden, pro-government militia and police came in vehicles screeching into the centre of the suburbs, firing dozens of tear gas canisters and baton rounds. The scene was chaotic as people ran away but then they came back, shouting anti-Gaddafi slogans. We knew that Fridays are always significant because a lot of the anti-government protesters gather in and around the mosque and come out into the streets. But this is proof that this isn't just an uprising in the east and perhaps the west of the country, but there are significant elements in and near Tripoli that are opposed to the regime. Despite the considerable risks they are running, they are prepared to protest and demand the end of a man who has ruled this country for 42 years. The atmosphere had been tense earlier, as noon prayers began in Tajoura's main mosque, while secret police milled around outside. There was also a heavy military presence on main roads around the district, where Gaddafi loyalists have been searching cars at checkpoints. There were unconfirmed reports of mosques having been closed and arrests overnight, while internet services appeared to have been cut off. The authorities stopped some foreign journalists leaving the main media hotel in Tripoli, saying it was to protect them from "al-Qaeda elements". Reporters were later told they could leave the hotel on condition they boarded official buses to government-selected locations. Protests last week after Friday prayers in several districts of the city ended in bloodshed when government forces fired on civilians, witnesses have said. Pro-Gaddafi militias have been roaming Tripoli in civilian cars, according to residents. 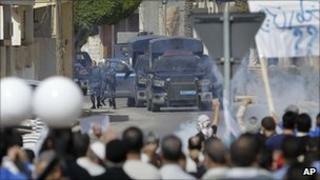 A wave of detentions, killings and disappearances has been reported in the city in recent days. Bodies of missing people have reportedly been left in the street. The opposition - a mixture of citizen militias and army defectors armed with machine guns and rocket-propelled grenades - have also been securing Brega in anticipation of a fresh onslaught by Gaddafi loyalists. Several hundred mercenaries from the Tuareg community in the north African country of Mali have just joined government forces, a senior Malian official told the BBC. The major western rebel-held cities of Zawiya and Misrata have also repelled attacks by Gaddafi loyalists. The leader of the opposition National Libyan Council reportedly told cheering crowds in Libya's second city of Benghazi they would not give up. "We are people who fight, we don't surrender," former Libyan Justice Minister Mustafa Abdel-Jalil, who went over to the opposition last month, was quoted as saying by Reuters news agency. "Victory or death. We will not stop till we liberate all this country." The UN refugee agency UNHCR has expressed new concern that people trying to flee into Tunisia may be finding their way blocked by armed pro-government forces, after a sudden drop in the numbers crossing the border. An estimated 10,000 people a day were crossing the border earlier in the week, but the number suddenly fell to fewer than 2,000 on Thursday, the agency says. "Many of those who have crossed the border appear to be frightened and are unwilling to speak," UNHCR spokeswoman Melissa Fleming. "We believe that has implications - that they may have been intimidated in some way." Tens of thousands of people, most of them migrant workers, have streamed to the border since the unrest began, sparking a humanitarian crisis.